Card Text Play: If your opponent has more than you, steal 1 and draw a card. When I play Neuro Syphon, do I gain the Æmber bonus before or after the “Play:” ability? Before. Gaining an Æmber bonus is always the first thing that happens when playing a card, so it happens before resolving the “Play:” ability. 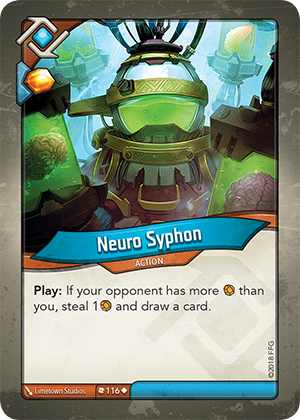 This means that if you have 1 less Æmber than your opponent before playing Neuro Syphon, you will now have equal Æmber when the “Play:” ability triggers, thus the rest of the effect wouldn’t resolve (i.e. you don’t steal Æmber or draw a card).